The Sixties ended a year late. On New Year's Eve 1970 Paul McCartney instructed his lawyers to issue the writ at the High Court in London that effectively ended the Beatles. You might say this was the last day of the pop era. 1971 started the following day and with it the rock era. The new releases of that hectic year--Don McLean's "American Pie," Sly Stone's "Family Affair," Marvin Gaye's "What's Going On," Joni Mitchell's "Blue," Led Zeppelin's "Stairway To Heaven," the Who's "Baba O'Riley," and many others--are the standards of today. David Hepworth was twenty-one in 1971, and has been writing and broadcasting about music ever since. In this entertaining and provocative book, he argues that 1971 saw an unrepeatable surge of musical creativity, technological innovation, naked ambition and outrageous good fortune that combined to produce music that still crackles with relevance today. There's a story behind every note of that music. From the electric blue fur coat David Bowie wore when he first arrived in America in February to Bianca's neckline when she married Mick Jagger in Saint-Tropez in May, from the death of Jim Morrison in Paris in July to the re-emergence of Bob Dylan at Madison Square Garden in August, from the soft launch of Carole King's "Tapestry" in California in February to the sensational arrival of Led Zeppelin's "Stairway To Heaven" in London in November, Hepworth's forensic sweep takes in all the people, places and events that helped make 1971 rock's unrepeatable year. "Soon every post-war year will have its own tombstone book, but this is already one of the best." "[An] expansive overview of the high-water mark of rock's album-oriented maturity....[Hepworth is] sharp and zingy....his mix of garrulousness and dry wit makes Never a Dull Moment a zip to read." "Cleverly crafted chapters form a glittery, boisterous month-by-month calendar of the 'annus mirabilis...the busiest, most creative, most innovative, most interesting, and longest-resounding year' of an era that produced music we are still listening to." "A revelatory account of the bombshell 365 days that gave birth to what the author dubs 'the rock era.'" "Hepworth brings rare perspicacity into the business machinations of the era, whose movers and shakers were, as he points out, often from a previous, less starry-eyed generation...Never a Dull Moment lives up to its title." "With its apt title, Never a Dull Moment makes you want to be twenty-five in the '70s again." 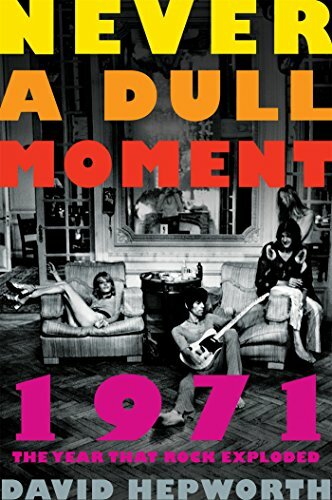 "[An] entertaining exploration of the year in music that was 1971....[His] chronicle of the year is loaded with gossipy anecdotes, adroit criticism, and earnest affection for the musicians, record executives, and technicians who defined it. An exuberant tour through a pivotal year in the development of popular music and culture." "[Never a Dull Moment is] laced with a wisdom gathered over many years as a journalist and industry insider, and with an enthusiasm for the music and an understanding of the economics driving the evolution of popular culture...a highly readable reassessment and a convincing argument for the importance of a year in which the culture of rock began to be aware that it was living out its good old days." "Fascinating cultural history...Vivid, irreverent prose and analytic insight distinguish the book from the legion of Boomer nostalgia titles. Alongside the requisite gossip, Hepworth's magisterial overview notes the exploitation of nostalgia, the rise of the singer/songwriter, the elevation of rock stars into louche aristocrats, and the transformation of FM radio to an album-oriented rock format." "An engaging and thought-provoking read... Hepworth points out more than once that at the time he had no idea how lucky he was. He knows now - and so do we." "One of the many strengths of Hepworth's book is that it combines both perspectives: emphasizing how much a part of 21st-century life these albums remain, while also reminding us that, back when they were made, what most people took for granted was pop's lack of a shelf life...Near the beginning of this richly enjoyable book, Hepworth argues that 1971 saw the pop era giving way to rock. Even so, his own approach is much more like the best pop: never taking itself too seriously, essentially out to entertain but also an awful lot smarter than its absence of solemnity might lead you to think." "David Hepworth's argument is simple: 1971 was 'the most febrile and creative time in the entire history of popular music.' It's an enormous assertion but he makes his point with infectious enthusiasm . . . Whether you agree is beside the point. This is a compelling love letter to a year of timeless music." "A clever and entertaining book . . . Hepworth proves a refreshingly independent thinker. His style is pithy and his eye for anecdotal detail sharp . . . a thoroughly provoking delight." "Scientifically unprovable but entertaining, illuminating and lipsmacking . . . a mighty fine and convincing read." "This is no 'my generation is cooler than yours' nostalgia trip. Just as movements in art, jazz or TV undeniably had Golden Ages then so too with the long-playing record and its seismic effect on subsequent generations. David Hepworth's forensic sweep of this astonishing twelve months is thoroughly absorbing and appropriately rollicking, expertly guiding us through one miraculous year in all its breathless tumble of creation." "There's a bit of a fashion at the moment for books focusing on a particular year and David Hepworth's 1971 is one of the best"
"If you haven't listened to the albums discussed in this book in a while (or never have), reading Never a Dull Moment will make you pull them up on your device and give them a listen. That is how good this book is." "A good mix of entertainment, insight and odd facts. Hepworth's thesis is...convincing"
"A witty, exhaustive look at the remarkable 12-month period that produced Led Zeppelin IV, the Rolling Stones' Sticky Fingers, Carole King's Tapestry and Marvin Gaye's What's Going On, to name just a few titles in a very tall stack of landmark albums... With a little luck, Never a Dull Moment might inspire today's young musicians to seek out a copy of Led Zeppelin IV or Sticky Fingers and use it as a springboard to invent their own brave new sound in rock 'n' roll." "A fast ride through that year proving that the hot pants sensation was not the only thing making news." "Fond, funny, beautifully written and fizzing with sharp and sweeping theories that instantly feel like facts."